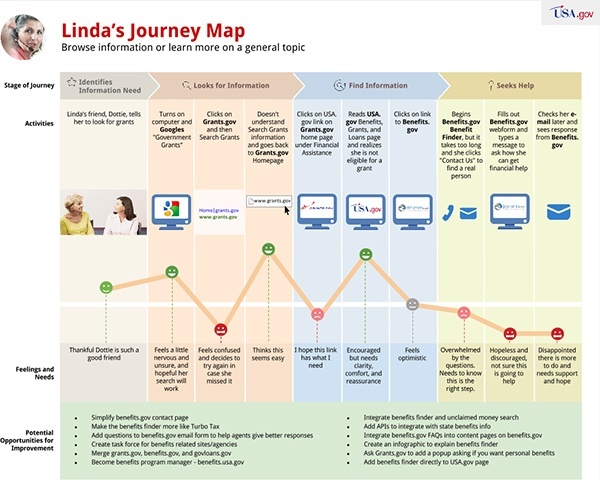 Journey maps are a visual representation of a customer’s end to end journey with your product or service. They are a powerful tool for exploring key interactions and experiences with your organization, programs, and/or services. Journey maps describe a customer’s entire journey, even the parts that occur before and after contact with your organization. They typically contain elements such as the customer’s attitudes, emotions, and needs. 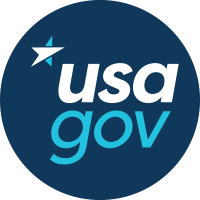 We recently updated USA.gov’s personas and used them as the backbone for our journey maps. 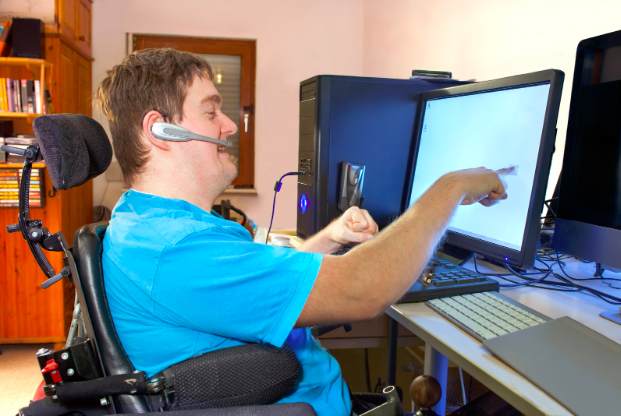 We updated our personas to help inform our Web design, content, and contact center services. We have a lot of data that we regularly analyze, and it tells us a lot about our customers’ journeys within a channel, but we knew we needed to better understand our customers’ journeys across channels. 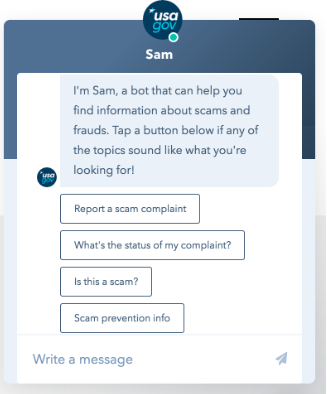 This is a best practice to better understand what a customer experiences, where there are disconnects in information, and where improvements can be made to your website, contact center interactive voice response recordings, or service delivery on any channel. We used information in the CX Journey Mapping Toolkit to plan the sessions and our approach. We invited subject matter experts, managers, and other stakeholders to participate in the mapping sessions and designated facilitators to lead the sessions and keep us on track. One of the most important preparation activities is creating the behavior line. This is the path your customer takes and the journey you’re going to map. 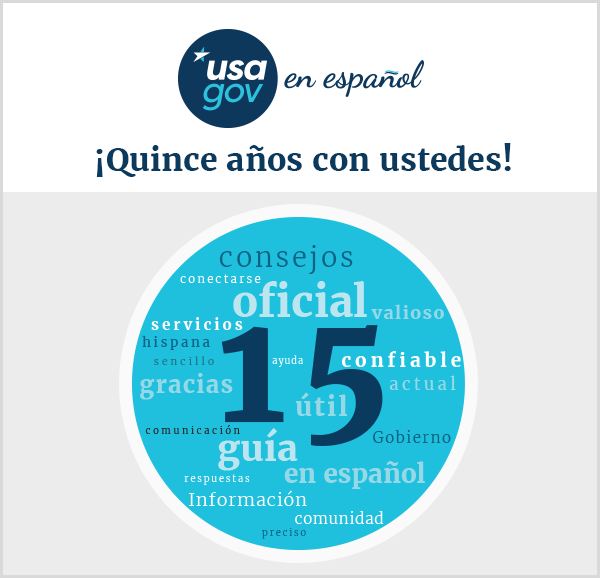 One of USA.gov’s personas, Linda, wants to browse information or learn more on a general topic. We selected “searching for financial assistance from the government” as the topic of Linda’s journey because it’s consistently one of the top reasons customers visit USA.gov or call 1-844-USA-GOV1, and it falls within the persona category. After adding multiple rounds of sticky notes and stickers to mark these different factors, we picked the greatest pain points in the journey and brainstormed ways to improve them. The journey mapping process and results helped us clearly see the pain points and gaps in the customer’s experience, including channel, content, and device gaps. It also helped to build empathy and increase understanding with our employees. While the process of journey mapping is enlightening, it doesn’t end with a map. Follow-up and planning for improvement are key. We’ve incorporated many outcomes from our journey maps into our customer experience (CX) improvement queue. We’ve prioritized several projects into our fourth quarter objectives and key results across our content, user experience, performance measurement, and contact center teams. Journey mapping isn’t a one-and-done project. We are continuing to analyze our results and prioritize areas for improvement, and we’ll continue to map future state journeys to help define desired experiences, keeping the customer at the center of our efforts. Michelle Chronister and Mary Ann Monroe lead the USAGov Customer Experience Team.